I am one of those people who love poetry. I love to listen to others read poetry, recite poetry, sing poetry – it doesn’t matter. I love to read poetry on my own. When I taught high school, I tried with all my might to get my students to experience poetry in a way that would shape them. This is because I believe words have power, and poetry is essentially a way to put this power to use in a moving way. I have memorized my favorite lines from poems. I cannot identify a single favorite poet or poem because there are just too many. 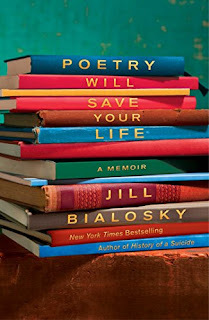 By love for poetry and my belief in its power is what drew me towards Poetry Will Save Your Life: A Memoir by Jill Bialosky. I believe in the title, so why wouldn’t I give this book a chance? I’m glad I did. This memoir is unusual. It is organized around themes rather than a memoir structured chronologically. In this novel, Bialosky identifies poems relating to life experiences (also thematic) such as death. She describes in vivid detail when she remembers hearing the poem or responding to it for the first time. For instance, in the chapter “Danger,” she discusses two poems in relation to her childhood friend who ends up on a dangerous life path. In addition to relating a life experience with a poem, she also analyzes the poem in detail. This means she explains how the poem works and the techniques the poet uses in relation to her it impacted her life. This stood out to me as a former English major and former English teacher because this is what I do. I tried to show my students how these poetic devices were used to make poetry more meaningful – and yet, it allows readers to make their own meaning. She also includes information about the poet, which I also appreciated. I also really like how this book does not have to be read cover to cover. You can certainly read it this way, but you can also choose to just read Bialosky’s reflections on certain poems in relation to her life. It is a book that you can read through slowly working your way through one chapter at a time. This is a book poetry fans will love to have on their shelves. English teachers will also be able to easily include sections of this memoir into their curriculum.